On this page I would like to show you some case studies of tennis lessons with students that I have been working with recently. It is one thing to understand the proper mechanics in Tennis but it is another thing to get a student to really change and improve their strokes! What I have found in tennis teaching over the years is that coaches rarely have a strategic game-plan and/or system for improving a player’s technique! Actually improving someone’s technique takes a very clear and systematic approach! Manfred used to fear hitting any type of backhand! He took many lessons but was never able to develop a topspin backhand stroke. All he could hit was a pushy kind of slice as you can see in the following video! Manfred would try to run around every ball possible to hit his forehand. He simply feared shots to his backhand. He would loose to any player that could consistently get the ball to his backhand! Now Manfred is not afraid of balls to his backhand anymore. He can hit a technically solid backhand topspin stroke. Of course he still needs to practice it quite a bit and start playing more matches with his new technique. The good news is that now it is just a matter of hitting and playing enough until his backhand becomes a weapon! Ullrich is a life-long tennis player. He is a true tennis enthusiast and loves to learn about the game. These students are of course the most rewarding for a coach. When Ullrich came to me he had been hitting forehands and backhands exclusively with slice for his entire tennis life! He had gone through several tennis coaches trying to learn a topspin forehand without any real success. He had spent a lot of money on many tennis lessons! Our first goal was to teach him a solid forehand topspin shot that is useful for his game and his level of play. Ulrich took one tennis lesson a week with me for about 2-3 months before he could really hit a good forehand topspin shot! From slice forehands to this technique in under three months! Ullrich rarely hits slice forehands anymore and his topspin forehand is now actually a weapon! Frederik is a 13-year old boy that I started working with in 2010. He had major problems with his strokes as well as with injuries. Having good technique is a big factor in preventing injuries! Especially Frederik’s backhand was weak and we completely rebuilt it in just a few tennis lessons! 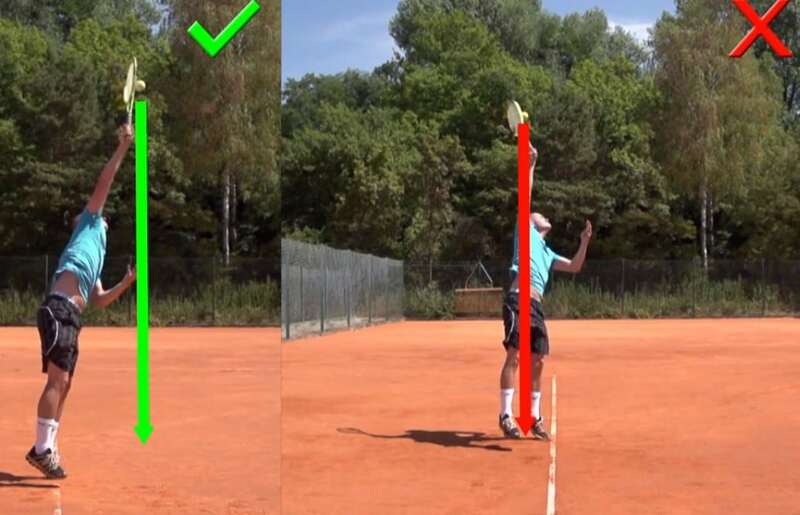 Check out Frederik’s backhand before and after! Typical tennis lessons consist of the coach shouting a few general tips at his students. Has your coach given you any of these general tips lately ? You need to hit with more spin! It’s all about your footwork! It is very unlikely that you will improve this way! The problem is not that these tips are generally bad (in this case only staying down is bad advice!). The problem is that just shouting these tips out at your students will not change anything in most cases! It takes a detailed systematic approach to really change someone’s technique. The use of video analysis is extremely important in my opinion! The students need to see what they are doing wrong exactly and then they need to see a video of how it should be done! When I work with someone on technique the first thing we do is videotape their strokes. We then compare those strokes either with strokes of professional players or good strokes of other players that I have in my database. Quite often it is not a smart idea for recreational players to copy all the elements of professional player’s technique! There is a basic framework though that every good player uses and that should be copied. This basic framework is based on the dimensions of the court and physical laws! We then identify which key body positions the student is missing and from there we develop a plan on how to improve those key body positions in our tennis lessons! Once the student understands what needs to be done and gets a feel for the correct way of executing his stroke, it is just a matter of repetitions! The concept of online tennis lessons is still fairly new. I believe that the Internet can be looked at as a great equalizer for tennis players. In Coaching Tennis there are only very few coaches that put a lot of time into becoming the best coach they can possibly be! Oftentimes they are too busy giving tons of lessons and the education they receive in order to get licensed is usually not good enough. So nowadays anybody that is ambitious enough can go on the Internet and find online tennis lessons from very good coaches. 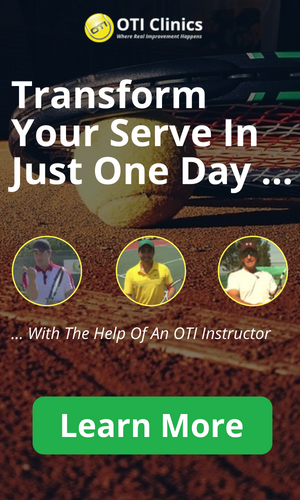 So Can Online Tennis Lessons Really Work ? If you have read around this website you know that there are certain key body positions that every player must get into in order to have great tennis strokes. These positions are based on physical laws and are the same for every tennis player. In order to find out if you are on the right track you need to film your strokes and compare them to the models of the key body positions. Then you have visual input for what you need to work on. Research has shown that tennis players learn extremely well through visual input. This whole process can easily be done online and therefore I believe that Online Tennis Lessons are a huge opportunity for all tennis players! One last thing to note is that it is extremely important to trust the process once you decide to work on your technique! When you change your technique it will almost always feel awkward in the beginning! The way you hit your shots is stored in your brain. You can imagine this like a hard-drive in your brain that has a program for each stroke on it. There is a forehand program, a backhand program, serve program and so on. All this information is stored in your brain and not in your muscles like many people believe! The brain has worked long and hard to figure these programs out and it resists change! So when you try to change your technique it will feel very strange in the beginning. This is a good sign because without this feeling you are not making a significant change! Even though the new technique feels weird it is important for the student to have at least a small success experience as soon as possible. Getting it right only one time is already really exciting and keeps people motivated! Therefore it is very important to realize that if you manage to get it right once, it is now only a matter of time and practice to automate the new technique! In the beginning you will get it right only rarely and then the shots that you execute well will slowly but surely increase. Make sure you are patient with yourself!